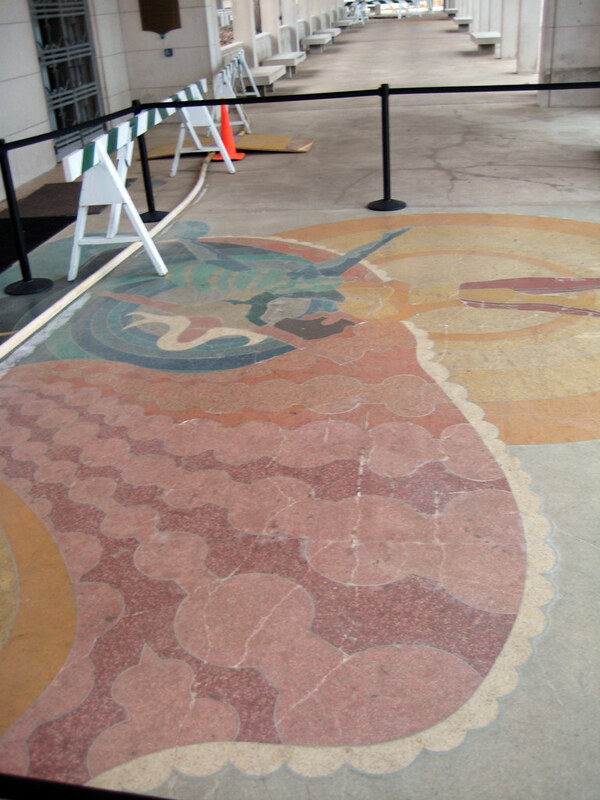 A water main break that occurred two weeks ago under the under the front portico of the Muny damaged the beautiful terrazzo work of art directly in front of the main ticket booths. 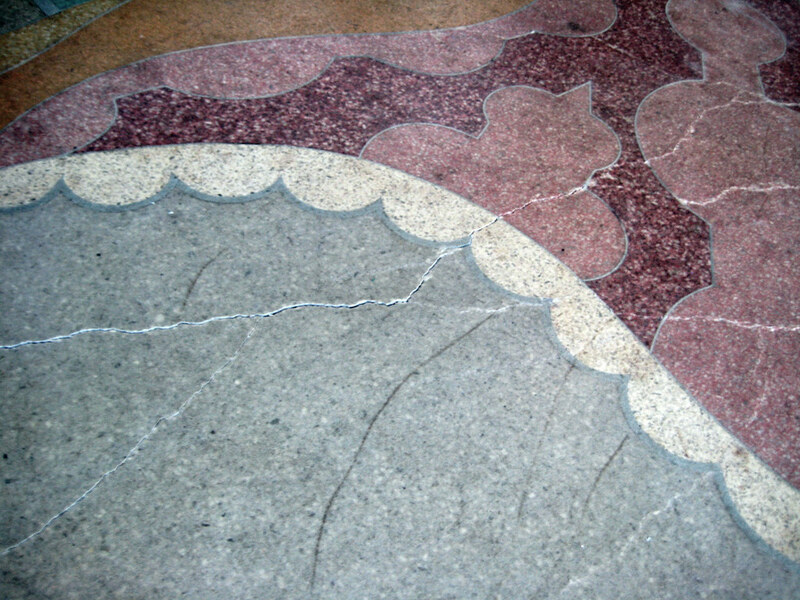 The break in the main cracked and heaved the floor area under the portico. The worst of the damage appears to be near the curb line and away from the intricate parts of the artwork. However a closer look reveals cracking farther into the work, but this area does not appear to be severely heaved. 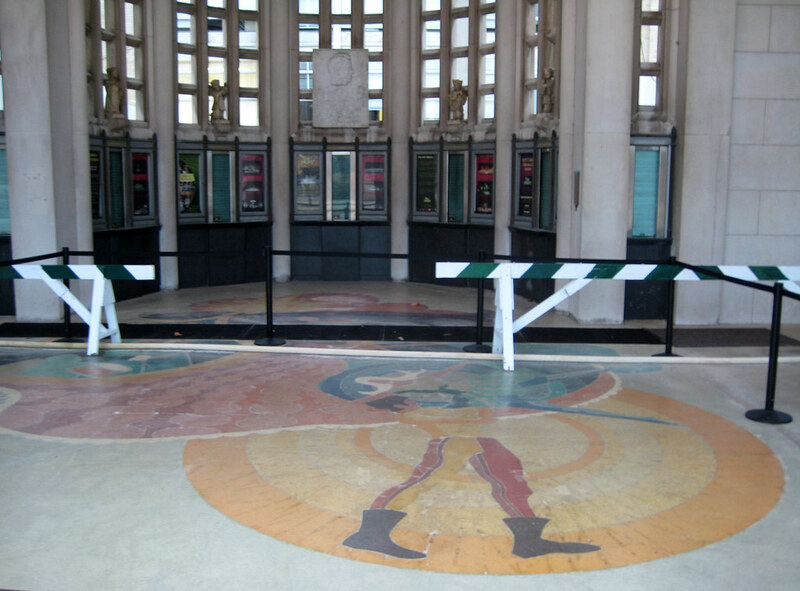 The Art Deco portico by Wischmeyer & Murphy was completed in 1939, the terrazzo mural however was not installed until 1971. 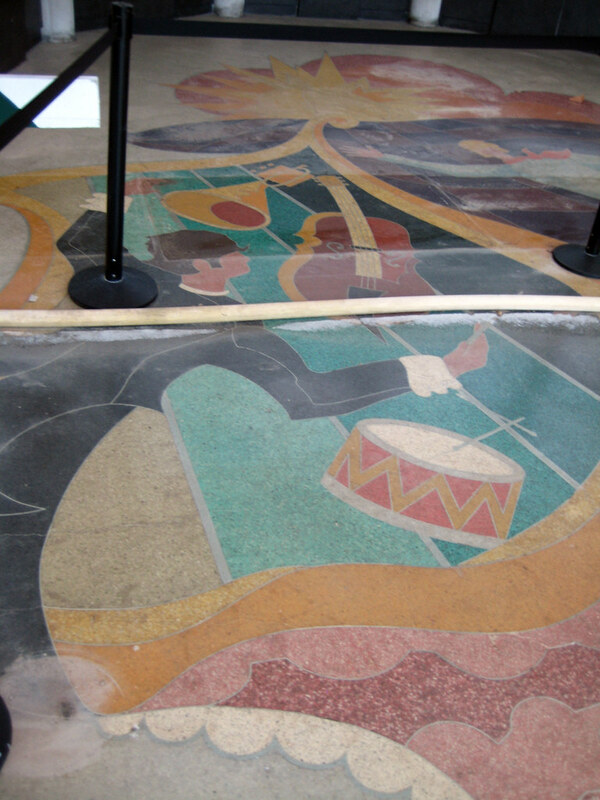 It was designed by Nancy Day, a student at Washington University who won a design contest for the floor at the main entrance of the Muny. 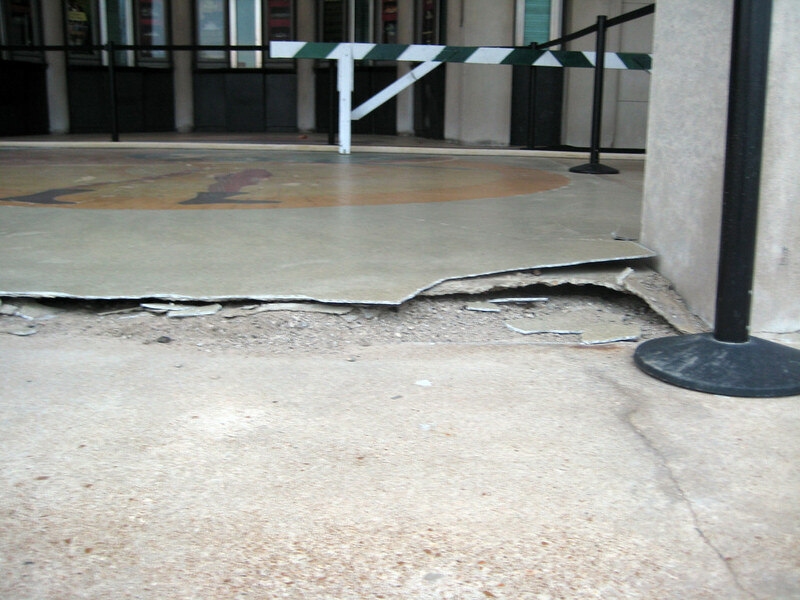 According to a Channel 5 News report, Sean Smith, the Director of Operations at the Muny is pessimistic that the artwork can be saved at all and the report states that a bare concrete slab may greet theater goers the summer! This seems like an extreme view, given that much of the artwork appears un-damaged. The report goes on to mention that the water main will be re-located out into the street so that it can never again cause problems for the building. 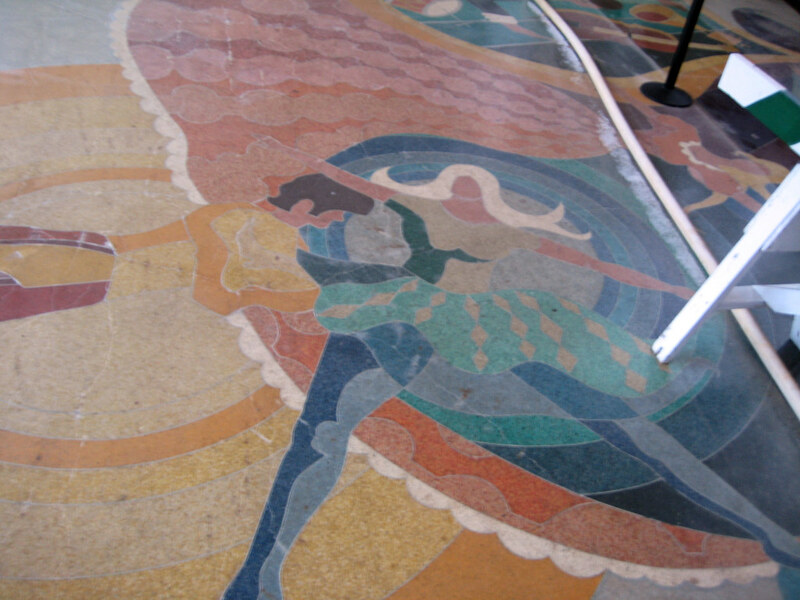 Given that large areas of the artwork remain unscathed, it would seem that everything possible should be done to restore the damaged portions of the artwork so that this irreplaceable is not lost forever. 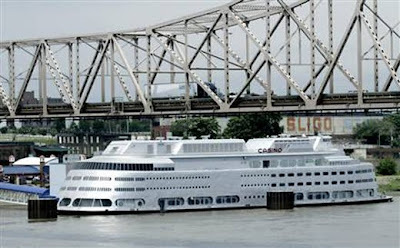 Wednesday, in an unprecedented move, Missouri Gaming Commission will likely recommend revoking the gambling license for the President Casino, which is housed on the streamlined SS Admiral riverboat. According to stories on KSDK and in today's Post-Dispatch, the President's owner, Pinnacle Entertainment has filed a petition with the Missouri Court of Appeals to halt the Gaming Commission's action. The President has operated as a casino since 1993, when riverboat gambling was legalized in Missouri. 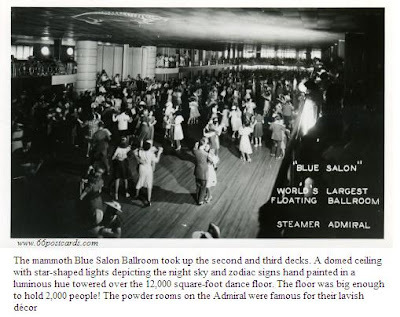 The Admiral received it's unique streamlined stainless steel exterior as part of its reconstruction as a luxury excursion ship, with it's first cruise in June 1940. Its hull however dates from 1907 when it was built as the steam ship Albatross. In recent years there have been questions about the condition of the aging hull, however the KSDK story states that Pinnacle had intentions of repairing the hull later this year. If the Missouri Gaming Commission revokes the license from the President, then the future of the Admiral riverboat could be questionable. Click here for more photos and history about the Admiral. This morning I headed out in the fog a few blocks north to photograph another building coming down in the West End neighborhood. 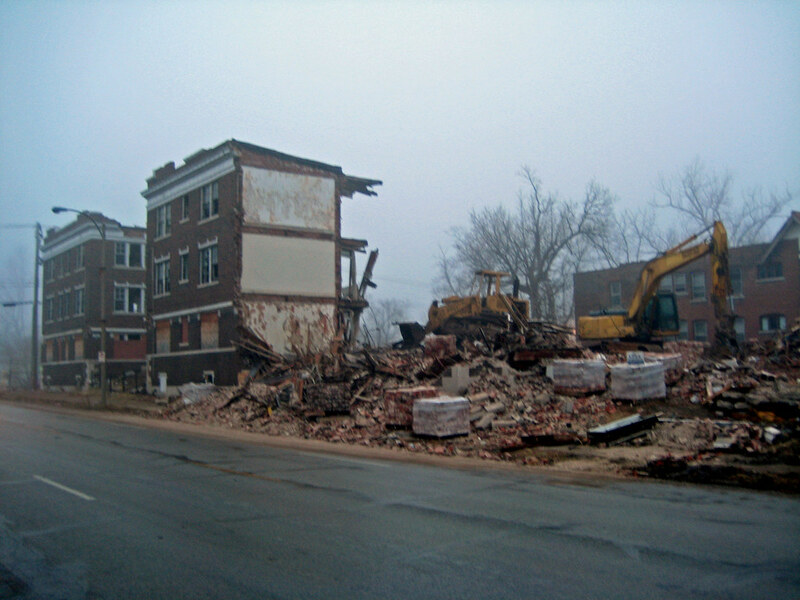 Not much was left of the large 30 unit apartment building that stood at the northeast corner of Cabanne and Goodfellow. 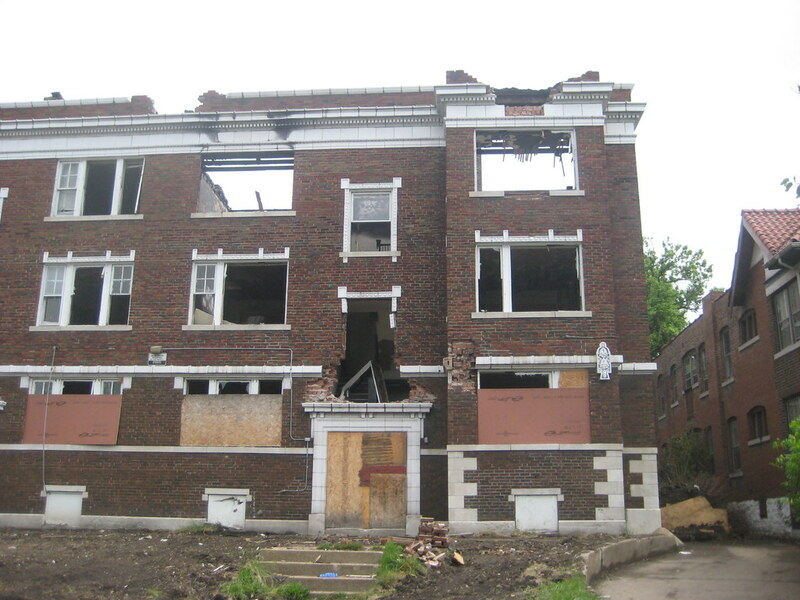 The building had been constructed in 1924, and is one of literally dozens of similar type apartment buildings from the 1920's that have been lost over the last 15 years. While many of these buildings were abandoned for decades and had deteriorated to the point where their floors and roof literally collapsed into the basement, this building was fully intact and occupied just a few years ago. See my earlier post focusing on Cabanne Avenue for some pre-demolition views of the building as well as my West End set on Flickr. 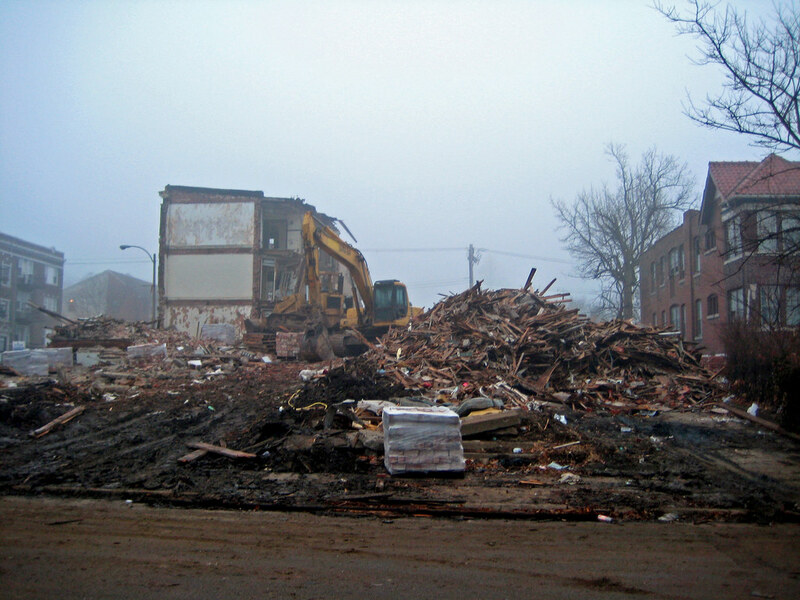 Thanks to Doug Duckworth for the heads up about this demolition. mysteriously stalled leaving the building in limbo for several months. 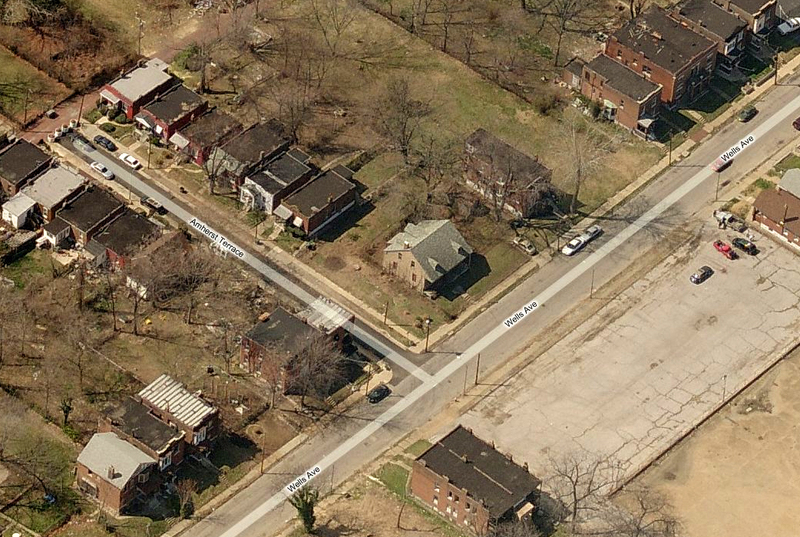 This week I was checking out an aerial photo of the neighborhood near a potential project that we are working on in the soon to be listed National Register District along Martin Luther King Drive in the Wellston Loop area (the district is actually in the City of St. Louis extending from Clara west to the City limit). A house at the corner of Wells Avenue and Amherst Terrace between Hamilton and Hodiamont stood out to me because of its form and the shape of its lot. 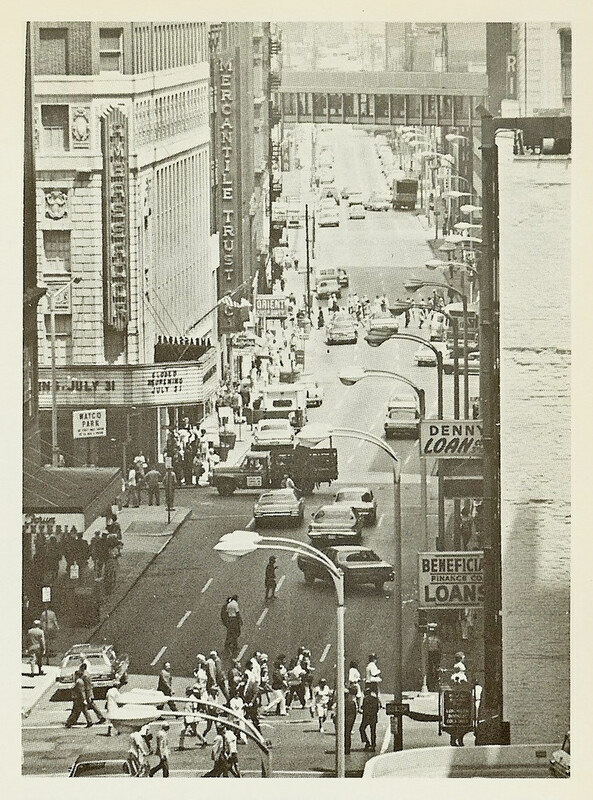 The house is located a block south of the former JC Penny Building on Martin Luther King, which is one of the City's few remaining examples of the International Style. The large paved lot across Wells from the homes site served the now vacant JC Penny. 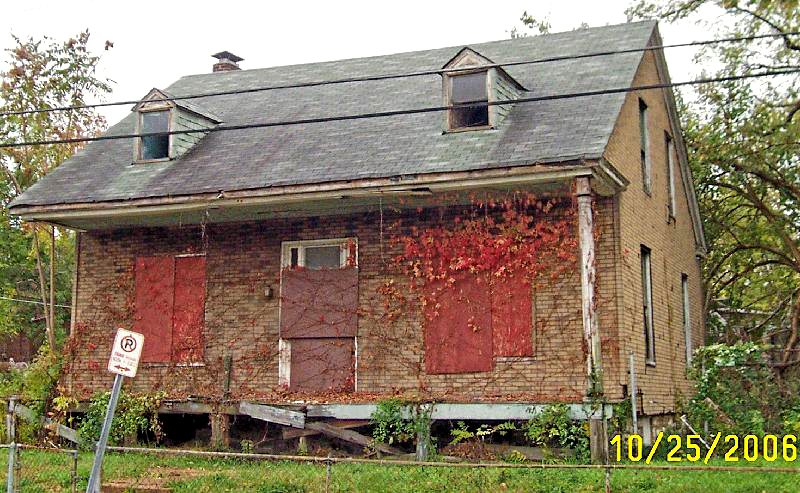 I took a look at Geo St. Louis, and they have two images of the house at 5942 Wells, which I quickly discovered had been demolished. The house was frame construction, but had been covered in asphalt shingle panels with a faux brick finish, which must have been someone's lame attempt to make the house "fit-in" with its predominantly brick neighbors. 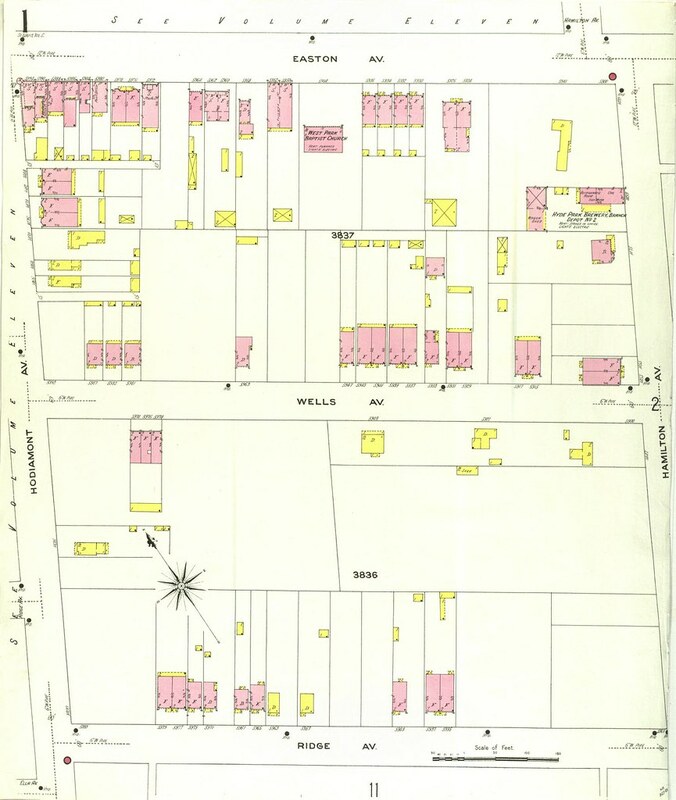 The home was likely one of the first in the area as a 1909 Sanborn map shows the house on a large oddly shaped piece of land with two other frame houses on the same parcel. Most of the block remained un-platted at the time with a large parcel just to the south containing only a frame shed, indicating that this may have been the remains of a farm. 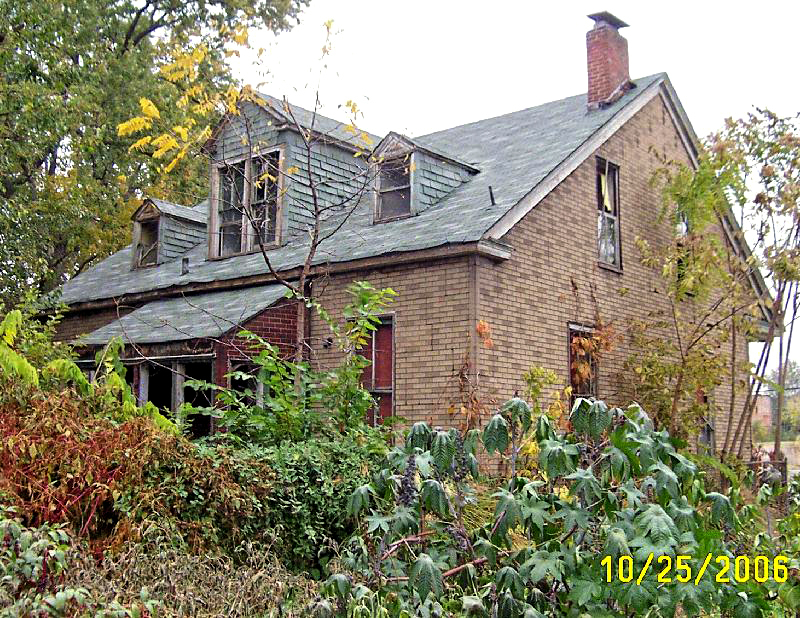 According to the City's property database, the home came into the possession of the LRA in 1998, and despite appearing to be in decent condition from the exterior in the 2006 photos, it was demolished in February 2007. 1909 Sanborn map. 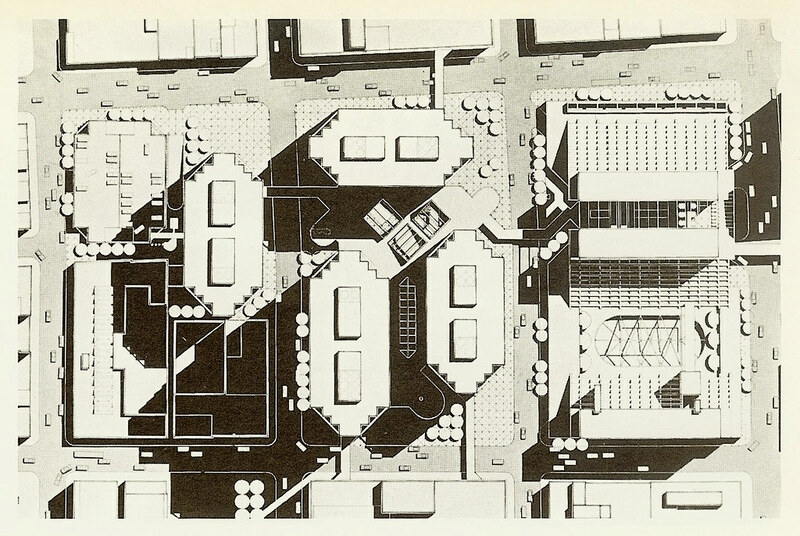 5942 Wells is right below "AV"
Crestwood Court: Anatomy of a Dead Mall or Emerging Arts Center? Last week I had to go out to my dentist at Gravois and Sappington and on my way back to the City I decided to stop by Crestwood Court (formerly Crestwood Plaza) to check out ArtSpace. It was almost noon on a Tuesday morning when I arrived. What I found was somewhat erie. It reminded me of the last days of St. Louis Centre. Of the 110+/- spaces, only about a dozen to 15 retail stores remain open. Sears is the only of three anchor tenants remaining. 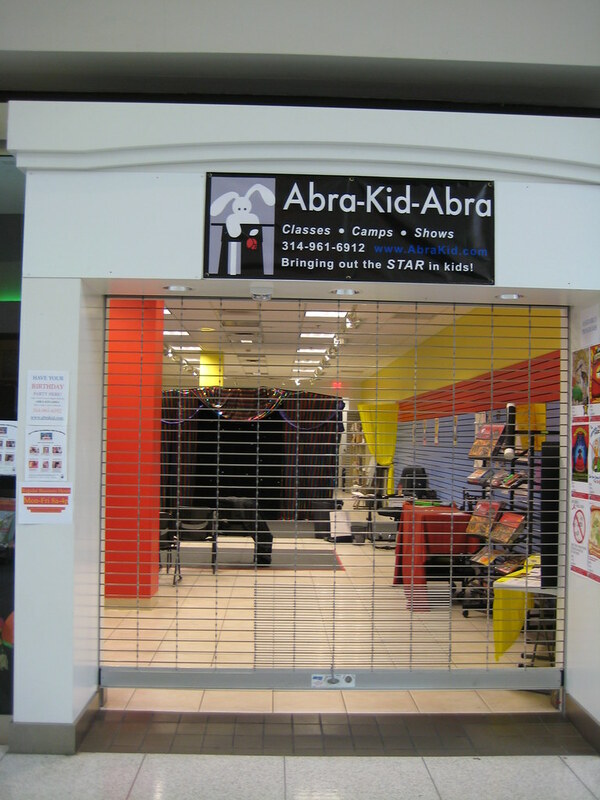 Of the vacated retail spaces, about half have been filled with arts organizations through the ArtSpace program where artists and arts related groups can lease storefront spaces for the bargain rate of $100 per month. 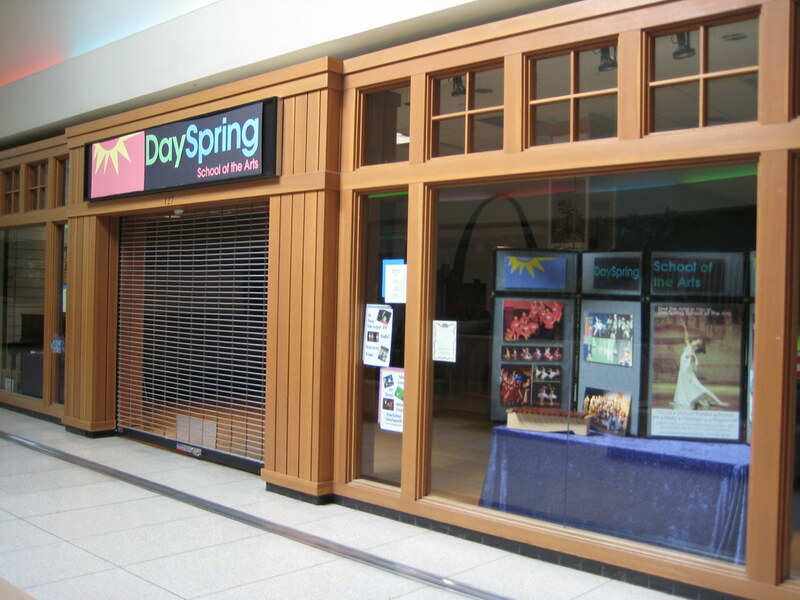 Many of the spaces are rented to small theater groups, so they are only open for limited times for shows and rehearsals. 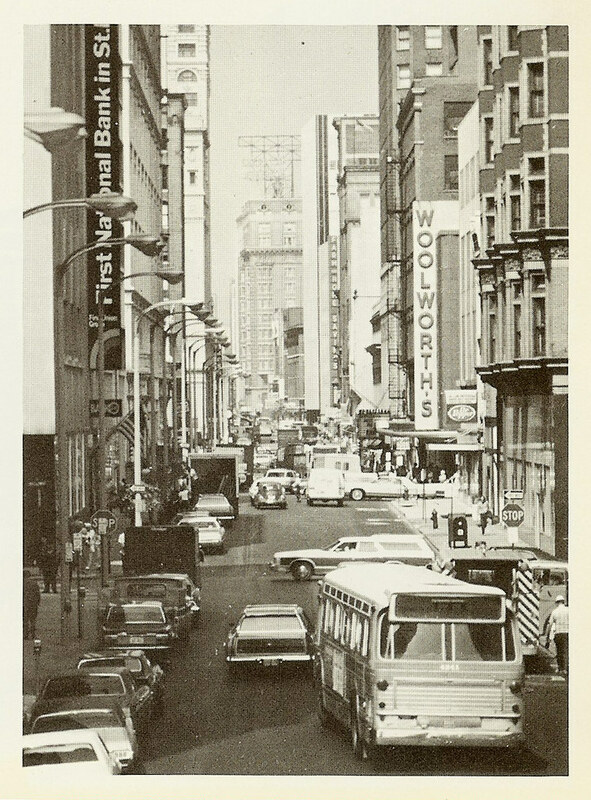 A few storefronts were open as studio/galleries for artists, but the general level of activity was very low. More than half of the few dozen people I saw while walking the entire length of the center and back were obviously mall walkers. While I find the concept of ArtSpace very interesting and the efforts of the center's owner, Sol Barket of Centrum Properties commendable, I wonder what is sustainable at the site for the long term? To be fair, Centrum has let the arts tenants know that this could be a temporary situation. Centrum bought the mall in March 2008 with the intension of demolishing it and building a new open air pedestrian friendly lifestyle shopping and entertainment center with about half a million square feet of space. With the fallout of the economic crash though don't look for this to happen any time soon. 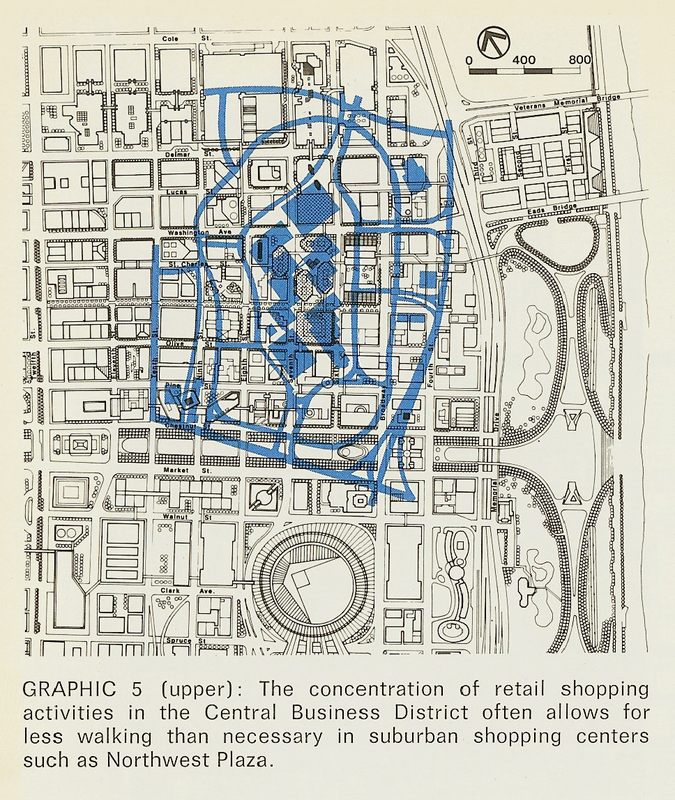 The retail marketplace is way over built and financing for additional retail centers is highly unlikely. 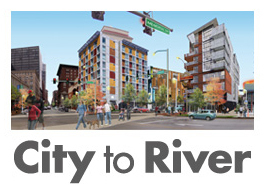 Building a large amount of new office space or new a couple thousand residential units also seems unlikely for at least the next few years if not longer. 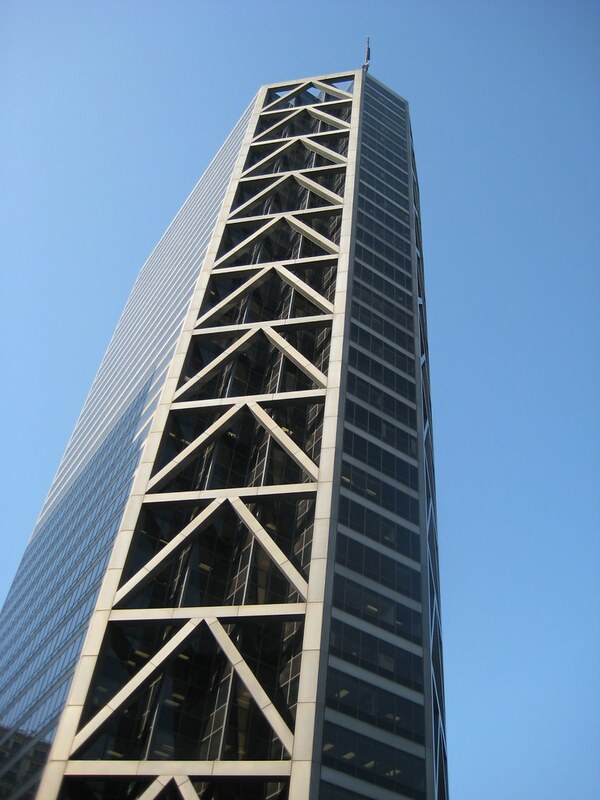 What then do you do with a million square feet of space sitting on 48 acres? 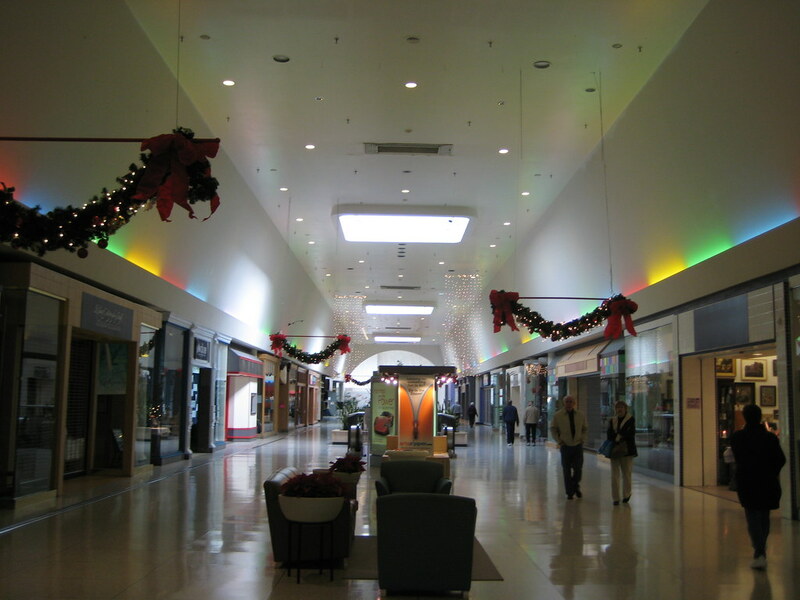 Some of the statistics about the mall are staggering. 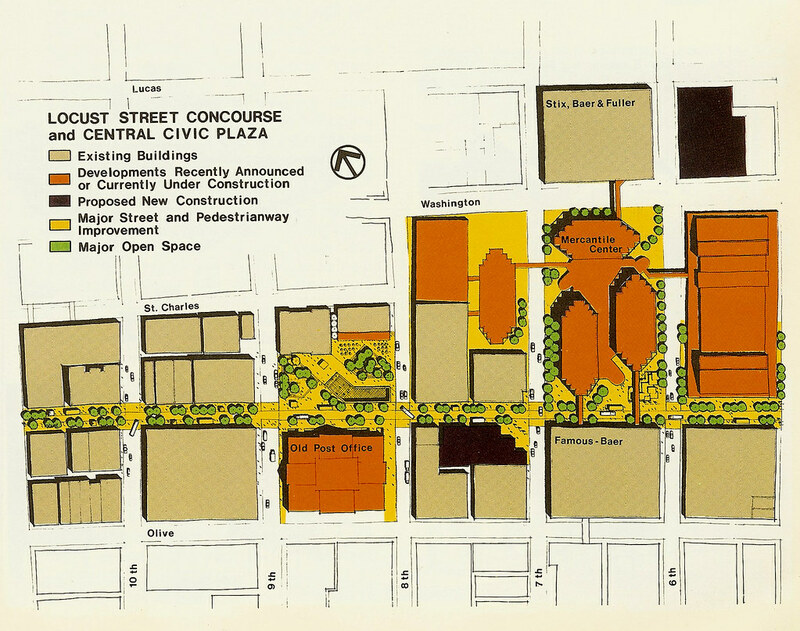 According to an article in the St. Louis Business Journal, the market value of the center plummeted from $99.3 million when Westfield bought it in 1998 to $17.5 million when it was sold to Centrum 2008. In terms of filling the million square feet, the ArtSpace initiative has filled about 200,000 s.f., and according to the article has actually helped attract about half a dozen new non-arts tenants, although it seems that others have closed in the last year. 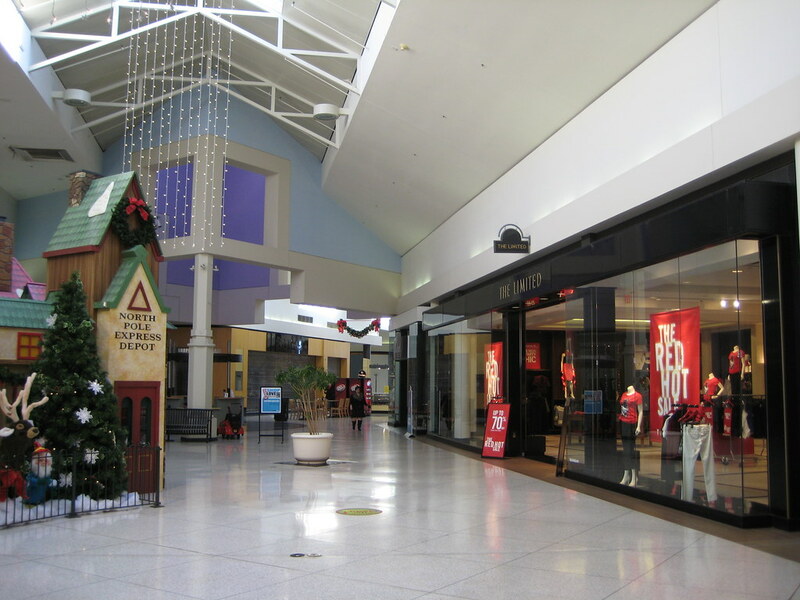 Instead of demolishing the mall and starting over to create an outdoor center, Centrum could simply turn the front of the mall (the stores on the Watson side of the center corridor) inside out by building new storefronts on the exterior and marketed to typical mall retailers. 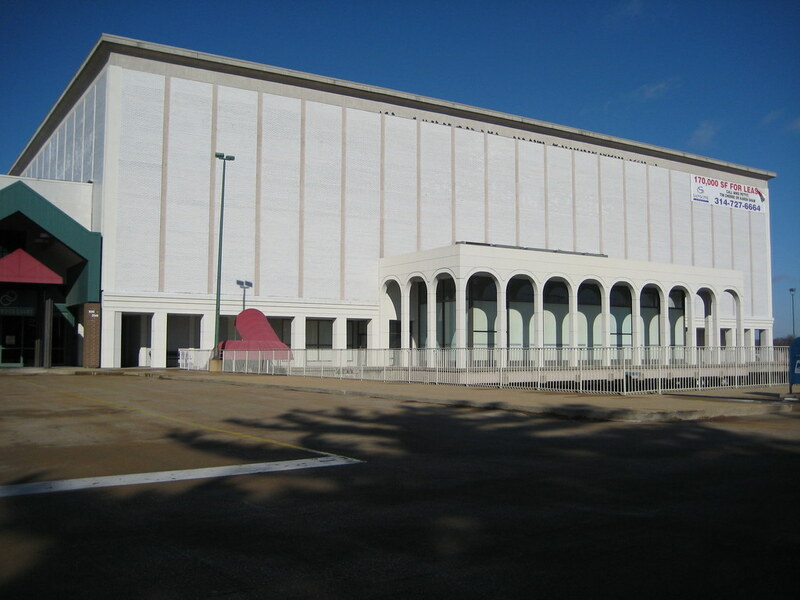 The vacant Macy's and Dillards building could be subdivided and marketed toward mid-sized retailers or altered for users looking for large blocks of open & relatively inexpensive office space. 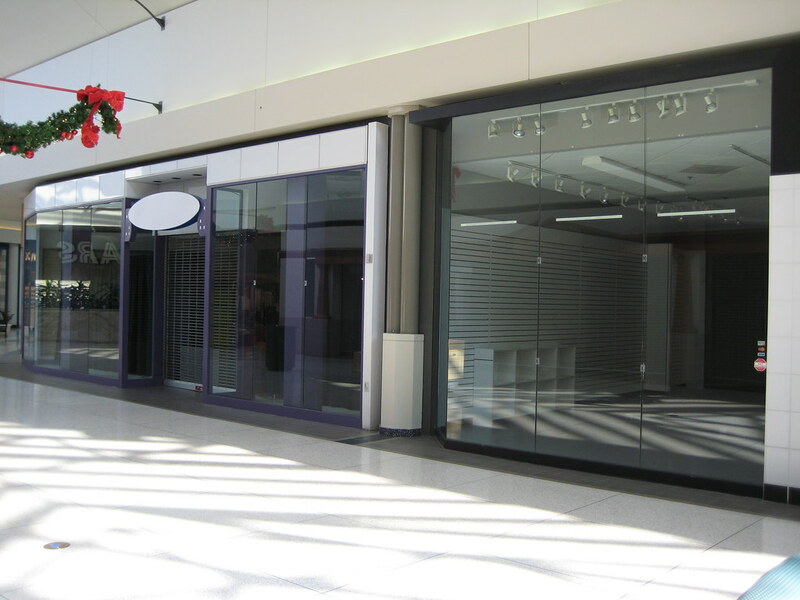 Remaining retailers on north side of the mall corridor would be relocated to face Watson and these spaces could remain for ArtSpace tenants with the mall corridor itself being transformed into a linear gallery. 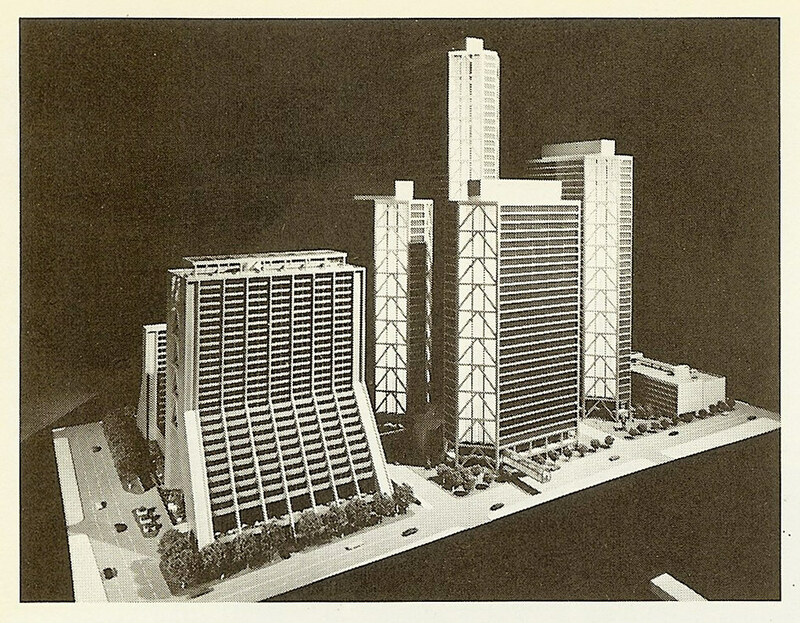 This type of transformation would cost far less than a tear down & re-built, and with the relatively low acquisition cost (less than $20/sf), would be far more feasible to finance. For an interesting history of the evolution of Crestwood Plaza from its beginning in 1957, take a look at Mall Hall of Fame (pan down past the Northland entry). 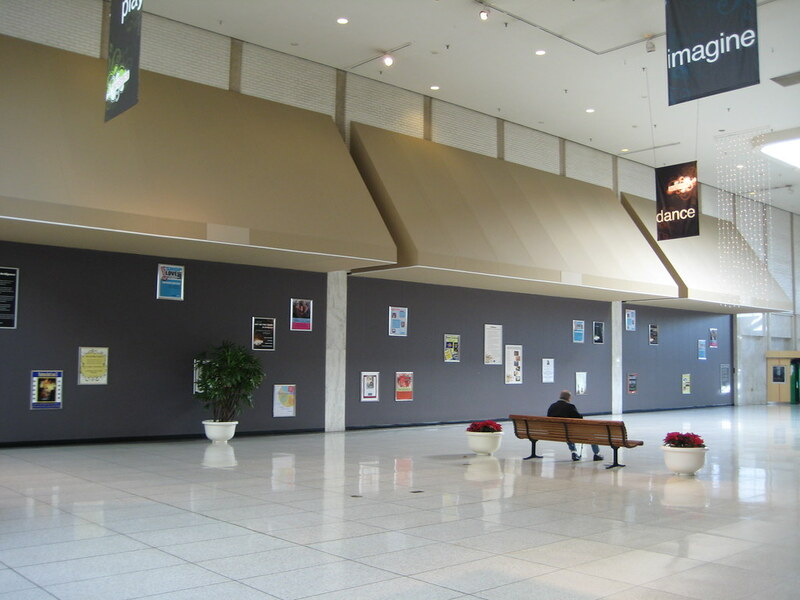 Also interesting to note, on Monday there was a story in the Post about Chesterfield Mall offering a smaller number of spaces to arts organizations. Also, yesterday, Macy's announced it would close its store at Northwest Plaza, so like Crestwood, only Sears will remain as an anchor.